Let’s celebrate the incredible gains in our industry this International Drone Day! ENGEO’s drone services include landslide mapping, creek erosion mapping, large-site reconnaissance, and earthworks tracking. Drones, also known as Unmanned Aircraft Systems (UASs), have made significant inroads into the AEC world. 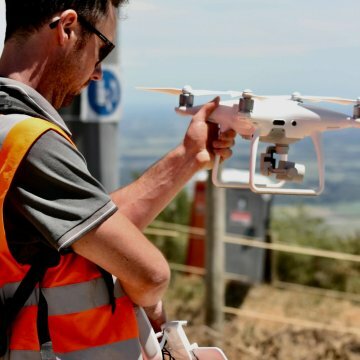 Drones have enabled incredible gains in productivity, reduced the time and cost of many operations significantly, and unlocked entirely new service areas. The ease of obtaining drones means that anyone who wants to use them for design and construction projects can get started quickly and cheaply. However, the reality is that there are nuances to getting the most accurate data out of the drone, and using drones always carries a certain level of risk that not everyone should undertake. Many development projects today must carefully manage their legal and public relations profiles. With drones taking such a high-visibility position in public media today, clients have expressed a keen interest in limiting their legal exposure from drone operations on their projects. In response, ENGEO is instituting airline-style procedures focused on improving safety and managing our growing fleet of drones and pilots. We utilize a Flight Operations Manual, Operations Specifications, and a Safety Management System in the US, which are required for charter and airline operators, but almost unheard-of among drone operators. In New Zealand, we follow local regulations. Additionally, all our drone operations are covered by a dedicated drone insurance policy. ENGEO’s team offers a variety of drone services, including landslide mapping, creek erosion mapping, and large-site reconnaissance. We can also create high-resolution orthophotos and digital terrain models to assist clients with visualization of complex 3D features.